If your diet is similar to most Americans you may need to double your intake of fiber. Statistics show that the average fiber intake for children and adults in the U.S. is less than half of the recommended levels. Fiber, considered an essential part of a healthful diet for children and adults, is a component of plant-based foods that is not digested or absorbed as it moves through the intestinal tract. 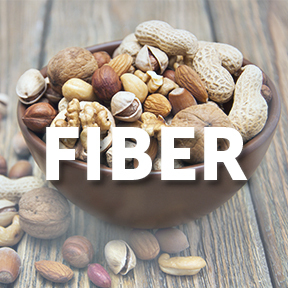 Many fiber-rich foods contain both soluble and Insoluble fiber. Soluble fiber, which dissolves easily in water and gastrointestinal fluids, is broken down into a gel-like substance by bacteria within the large intestine. Insoluble fiber, which does not dissolve in water or fluids, moves through the gastrointestinal tract basically intact, thereby contributing zero calories to the diet. A high intake of fruits, vegetables, pulses and whole grains exerts many health-promoting properties. Individuals with higher intakes of dietary fiber appear to significantly reduce their risk for developing coronary heart disease, stroke, hypertension, diabetes and gastrointestinal diseases. As well, diets that are low in fiber are linked to a higher risk of colon cancer. Fiber and weight maintenance: Dietary fiber found in fruits, vegetables, whole grains and legumes is essential for weight maintenance, as well as weight loss. Fiber-rich foods are satiating and tend to be low in calories and high in phytonutrients, which helps minimize hunger and cravings. Soluble fiber lowers dietary fat absorption by blocking fats that would otherwise be digested and absorbed. Insoluble fiber fills space in the stomach and intestines, which makes one feel full, thereby helping to manage weight. Observational studies have shown that regular intake of dietary fibers from various plant sources decreases obesity prevalence. Fiber and intestinal motility: In the gastrointestinal tract, soluble fiber absorbs fluids and byproducts of digestion, helping to speed the processing and movement of waste and preventing constipation. By keeping the intestinal tract working properly, insoluble fiber helps to clean out bacteria or intestinal buildup, thereby reducing the risk of hemorrhoids, diverticular disease and colon cancer. Fiber and inflammation: Some studies have found that those who eat a healthy amount of high fiber foods have lower blood levels of C-reactive protein, a marker of inflammation linked to rheumatoid arthritis, heart disease and diabetes. As well, high fiber foods feed beneficial bacteria in the microbiome, which release chemicals that promote lower levels of inflammation system wide. Fiber and diabetes prevention: Per the National Institutes of Health (NIH), increased soluble fiber intake balances blood sugar and improves insulin sensitivity in non-diabetic and diabetic individuals. Fiber slows the release of sugar absorption into the bloodstream, contributing to glucose control by preventing a spike in blood glucose levels. Currently, along with weight loss and increased physical activity, insoluble fiber, such as found in whole grain cereals, is considered to be especially effective in the prevention of type 2 diabetes. Fiber and cholesterol: Soluble fiber as found in beans, oats, flaxseed and oat bran may help to lower LDL cholesterol and thereby decrease total blood cholesterol levels. By reducing cholesterol levels, stabilizing blood sugar and decreasing fat absorption, regular soluble fiber intake may reduce the risk of heart disease, as well as circulatory conditions. To give the gastrointestinal system time to adjust and avoid intestinal discomfort, those not currently on a higher fiber diet should gradually increase their fiber intake over the course of several weeks, as well as consume plenty of water throughout the day. While the optimal amount of daily dietary fiber may vary per individual, generally men require a minimum of 34 grams; women 28 grams; teenagers 25 grams; adolescents 22 grams; children 16 grams; and toddlers 14 grams. Excessive fiber consumption of more than 70 grams per day can cause bloating, gas and discomfort, as well as interfere with the absorption of essential nutrients, as fiber binds with minerals such as iron, calcium, magnesium and zinc. Fiber Formula by Integrative Therapeutics®: This proprietary product includes soluble and insoluble fiber for improved colon function and cleansing. Ingredients include oat bran, psyllium husk, marshmallow root and pectin. Soy free. Contains wheat. FiberMax™ by Advanced Naturals: This convenient daily fiber supplement is formulated for sensitive colons. Specific ingredients such as L-glutamine, probiotics and FOS nourish the digestive tract, support regularity and maintain a healthy bacterial balance. Additional ingredients include fennel seed, marshmallow root, slippery elm bark and triphala. All natural, no added fillers. PaleoFiber Powder by Designs for Health®: This unflavored, unsweetened powdered formula is ideal for increasing overall fiber intake. PaleoFiber combines natural soluble and insoluble fibers derived from fruits, vegetables, roots, seeds and tree extracts with added prebiotics and friendly probiotic bacteria. Free of wheat, yeast, soy, gluten, eggs, dairy, corn and artificial colors, flavors, sugars and preservatives.